Now available in paperback, the most comprehensive--and only author-authorized--Wendell Berry reader. In a time when our relationship to the natural world is ruled by the violence and greed of unbridled consumerism, Wendell Berry speaks out in these prescient essays, drawn from his fifty-year campaign on behalf of American lands and communities. The writings gathered in The World-Ending Fire are the unique product of a life spent farming the fields of rural Kentucky with mules and horses, and of the rich, intimate knowledge of the land cultivated by this work. These are essays written in defiance of the false call to progress and in defense of local landscapes, essays that celebrate our cultural heritage, our history, and our home. With grace and conviction, Wendell Berry shows that we simply cannot afford to succumb to the mass-produced madness that drives our global economy--the natural world will not allow it. Yet he also shares with us a vision of consolation and of hope. We may be locked in an uneven struggle, but we can and must begin to treat our land, our neighbors, and ourselves with respect and care. As Berry urges, we must abandon arrogance and stand in awe. 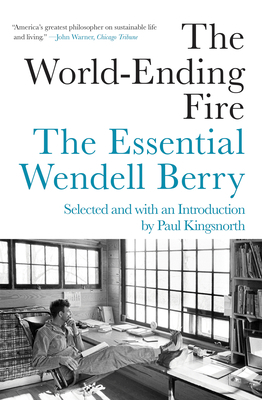 WENDELL BERRY, an essayist, novelist, and poet, has been honored with the T.S. Eliot Award, the Aiken Taylor Award for poetry, the John Hay Award of the Orion Society, and the Richard C. Holbrooke Distinguished Achievement Award of the Dayton Literary Peace Prize, among others. In 2010, he was awarded the National Humanities Medal by Barack Obama, and in 2016, he was the recipient of the Ivan Sandrof Lifetime Achievement Award from the National Book Critics Circle. He is also a fellow of the Academy of Arts and Sciences. Wendell lives with his wife, Tanya Berry, on their farm in Henry County, Kentucky.